Synopsis: A Young couple is forced to stay by a crazy old tenant, in an apartment they were just visiting. 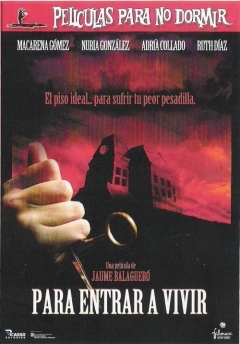 My Short Review: Para Entrar a Vivir is part of the Spanish Anthology “Peliculas para no dormir” and directed by Jaume Balaguero before he went on to write and direct Rec and Rec 2. And it shows. The location (an old abandoned apartment building), the main character (a woman caught into a situation she does not control and/or understand fully), the scare tactics, many things feel like a rehearsal for Rec. Unfortunately, it is not as good as the famed horror movies. The characters are really acting against any kind of logic (why not kill the crazy woman when they could) and it makes you wonder how a healthy young couple could not put more of a fight against somebody almost twice their age!! Despite those, the pace is good, it is after all a short movie ( less than 70mn, credits included) and the potential of Jaume Balaguero is fully apparent here. I’d recommend it to anyone who wants to work a little scare before going to bed, without having too much time to spend on a full feature film.